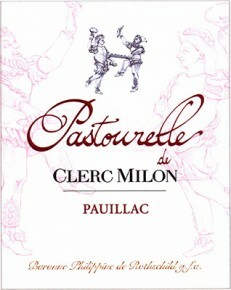 Pastourelle de Clerc Milon, the second wine of Château Clerc Milon, has joined the dance and already accomplished its first very confident steps in the company of fine Pauillac wines. Living testimony to the considerable improvements in quality achieved at the property since the arrival of Baron Philippe and his descendants, Château Clerc Milon now has a second wine. It reflects the continual quest for excellence of this flourishing Classified Growth estate. Pastourelle de Clerc Milon comes from an exceptional terroir. Made with grapes from selected vines on the famous estate, it is made and bottled with the same painstaking care. The grapes are harvested in small open crates then fermented in the Château Clerc Milon vat house and the wines are matured in oak barrels in the traditional manner. The particular attraction of Pastourelle de Clerc Milon, a round and supple wine, lies in the rich elegance of its aromas and flavours. Its name comes from a traditional dance, the pastourelle, which evokes a knight’s romantic encounter with a shepherdess: the name echoes the pair of dancers that adorn the label of the Grand Vin. Made of gold, enamel and pearls, this precious miniature from the Museum of Wine in Art at Château Mouton Rothschild belonged to Catherine II, the empress of Russia, and is inspired by characters of the Commedia dell’Arte. Baroness Philippine de Rothschild chose it as the Clerc Milon emblem because of her love of the theatre. 2009 is the inaugural vintage of this second wine, whose label also shows Château Clerc Milon’s two dancers. Ready for drinking now, Pastourelle de Clerc Milon may be found on the tables of the best restaurants.